Saturday was the summer day that fills our daydreams in January. Temperatures were in the 80s, the sun was out, and the air was dry. Rachel and Lily accompanied Wizard and me on a ride to the tree farm. The flies were not as bad as they were in previous days since we rode in the middle of the afternoon and there was a dry breeze to keep them moving. As I had hoped and expected, Wizard was even better on his second ride to the tree farm this year than he was on his first ride. He was more focused. The walk through the neighborhood went off without a hitch, and he carefully walked on the shoulder of the road for the brief bit of road riding that we have to do. The trot and canter work was very exciting for Wizard, and he gave my arms a workout, learning on the bit in earnest, hopping and swapping leads as we bounded along. He has a soft mouth, and he did not take off, but it was clear that he wanted to GO. The horse path is maybe a mile long with a few very gentle hills, and it’s a lot of fun. After our little joyride, we walked the rest of the way through the tree farm. We ended up on an unfamiliar trail, and I dropped the reins as an experiment. Wizard successfully got us back to the main trail, by way of a pretty crazy trail that we’ve never taken before. As we reached the last leg of the ride, I heard a ka-CLINK with each step that Wizard took. It became more pronounced when we walked on pavement. Wizard’s shoe is loose. 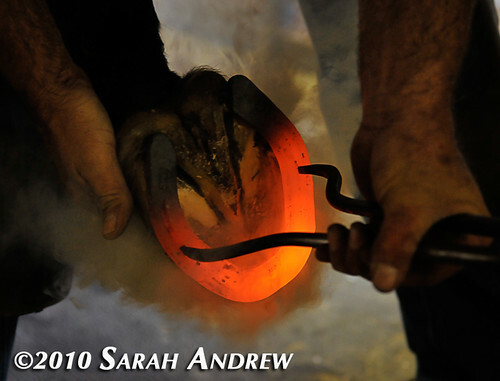 He’s actually a week overdue for the farrier (bad Sarah!). I checked out the shoe and it’s not loose enough to pull- just a tiny bit wiggly.